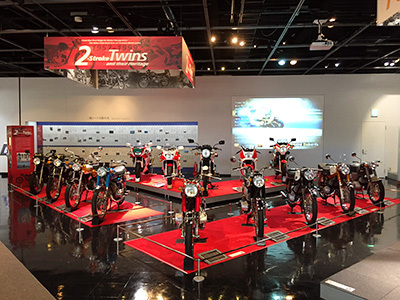 2-Stroke Twins and Their Heritage - Communication Plaza | Yamaha Motor Co., Ltd. Since Yamaha Motor was founded, its specialty was motorcycles with simple and lightweight 2-stroke engines, building numerous models and earning a worldwide reputation for its knowledge and expertise with the format. In particular, Yamaha built high-performance 2-stroke twins one after another that defined the eras they debuted in, a practice that lasted until the end of the 1990s. Even today, with motorcycles now comprised almost entirely of 4-strokes, these older 2-stroke models continue to fuel the passion of classic motorcycle enthusiasts. 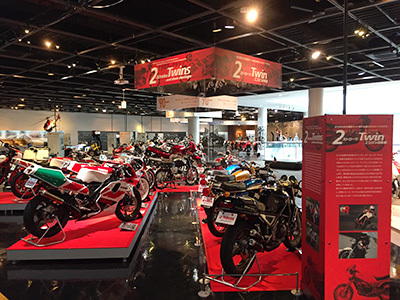 This exhibition gathers together several 2-stroke twins that helped propel Yamaha motorcycles onto the world stage, introducing them together with samples of their unique exhaust notes for you to enjoy. Feel free to take your time and savor the unique and timeless appeal of these iconic machines.